Here are the answers to some frequently asked question about using our products. If your question is not answered here feel free to contact us for further assistance. Q . My decking and siding is new. Why do I have to clean it before I treat it? A. It is important to always begin with a clean surface. If you could look at the wood under a microscope, you would see how dirty it really is. Construction creates more dirt than you would imagine. Try wiping a damp white rag over the surface to see how much dirt wipes off. Also remember that mildew spores are invisible until they die. You certainly don’t want to trap mildew under your finish. Wood finishes adhere and penetrate much better on clean wood. Q. Is it really necessary to sand smooth wood before it is treated, for example on my brand new deck or smooth wood siding? A. Yes, if the wood is mill glazed. Sometimes you can actually see a sheen on new wood. You can throw water on it and it just beads up. The cutting blades at the mill often burnish the wood’s surface fibers and compact them so much that the milling process creates a temporary seal of its own. On brand new wood, most penetrating finishes struggle to get through the mill glaze. Instead, it will dry closer to the surface and wear off faster. Some chemical washes such as Clean & Brite help a little to remove the mill glaze, but nothing works like sanding with 60 -80 grit paper to rough it up a little. Timber Pro is made from ultra fine particle oil/acrylic and penetrates well but a smart homeowner or contractor will always sand their smooth wood before treating it if they think its mill glazed or just want the stain to absorb and go on more smoothly. Mill glaze will wear off on its own if the untreated wood is left to the weather for a 3 – 4 months. Q. Can I use a bleach solution to clean my wood and remove mildew? A. No, bleach is very harmful to the wood surface. It will remove mildew but will damage your wood in the process. Bleach breaks down lignin, the “glue” that holds wood together. Bleach also tends to turn the wood an unnatural and unattractive pale color. Instead of bleach, we recommend Clean & Brite, a biodegradable wood cleaner and brightener. Clean & Brite should remove all dirt, superficial mildew, and mild weathering. It also brightens the wood back to a natural tone. If the mildew or graying is more severe we recommend cleaning it off with our Strip and Brite solution, but remember, Strip and Brite will remove finishes as well. Q. How long do I have to wait for my wood to season and dry before I use your formula? A. Timber Pro UV finishes can be applied to brand new, unseasoned wood as long as the moisture content is less than 21%. Our formula is a water-borne formula, so there is no conflict with the water that may still be in the wood. If your wood has a higher moisture content however, it will not absorb as much finish and the more stain it absorbs, the longer the finish will last. If you suspect your wood may be above 21% moisture content we recommend waiting for the wood to dry out before application of Timber Pro UV, otherwise you may see a whitish film appear within a few minutes after application which clears up when the finish dries but it could take a long time to dry. Q. Do I need to strip off other products before I apply your product? A. That depends on the color of the wood and condition of the previous finish. Since some of our finishes are very transparent, it is important that the wood underneath is even in tone and color. If the previous finish has darkened and discolored, or has turned completely gray we recommend using Strip & Brite to restore the wood. Also, if the previous finish is still beading up water, it may resist penetration of our product, since Timber Pro UV is waterborne. The basic rule is: if the color of the wood is even and bright after cleaning and the wood is dry and absorbent, you don’t need to strip it. If the color is patchy, gray or dark, and if the old finish still beads up water, strip it. If the old finish is Timber Pro UV, you should use Clean & Brite before re-application, but you do not need to strip the wood unless you waited too long and the finish has really deteriorated and is not uniform in color. Q. Is it really necessary to apply 3 coats on siding? A. Not always, 3 coats is our recommended application for our transparent series . If you were painting your siding, you would most likely be applying 3 coats. Most siding is rough sawn and is very absorbent. Your goal is to fill up the wood pores until they cannot hold any more stain. The stain will last much longer if you can get 3 good coats into the wood. In the transparent stain series, the third coat is always the Clear UV formula, while the first 2 coats are a transparent or semi-transparent color. This Clear UV topcoat helps protect a protective layer over the color of the first 2 coats which puts one more protective layer over the colored coats. Important, there are a few of our colors, especially some of the Semi Transparent or Semi Solid colors that do not require a third top coat of Clear UV because they contain higher amounts of pigment. Call us and ask if your color choice is one of those, toll free 888-888-6095. Q. What happens if I get stain on my glass windows, vinyl frames or other surfaces where I didn’t want it? A. Don’t worry! If the Timber Pro UV finish is still wet, it can be wiped off with a damp sponge or cloth. If it has dried, it can be removed with our Strip & Brite cleaner. When using Strip & Brite on surfaces other than wood, always try a small test patch first to make sure it doesn’t react negatively with the surface you want to clean. Strip & Brite will remove oil-based paints and will oxidize some metal surfaces. Q. Why is it important NOT to apply Timber Pro UV in the hot sun and wind, especially at temperatures over 80 degrees? A. Remember, the goal of a penetrating finish is to penetrate! The sun heats up the wood and the stain will dry on the surface before it has a chance to soak in. When Timber Pro UV sits on the surface, it will appear shiny and could chip or flake off and simply not last as long. Rule of thumb: if the wood feels warm to the touch, you need to wait until it is in the shade or lightly mist it with water to cool it down before application, but you will always get better results when you apply on cloudy days or in the shade. Q. Why is it important to start at the bottom of the wall and work up rather than from the top down? A. Because if you apply heavily as you are supposed to, the stain will form drips that will drip down and streak the siding below. These drip streaks could absorb quickly and leave a streak that you won’t be able to brush out quickly enough, especially if it’s a warm day. That drip streak might show. When you start low and work up, the drips will form on wood that is already wet with stain and you can easily brush them out. Q. What happens if it starts to rain on my stain before it has had a chance to dry? A. Well, hopefully your overhangs are wide enough that the rain won’t really hit the siding much. If it does, it may start to take on a milky whitish appearance. If the rain stops and it dries out in the next few days the whitish area’s will disappear. If it stays cold and wet, the whitish area’s may reappear over the winter. All you can do is wait till summer and let it finally cure and then take a look at it. You may need to strip it off and re-do it if the color has really mottled but it may look fine and just need a refresher coat over it to re-stabilize it. Q. Can Timber Pro UV be painted over at some future date? A. Yes, but only with latex paint. In fact, some people use our Clear UV formula as a wood primer because it does such a great job at stabilizing the wood and preventing the wood’s natural extractives from leaching out due to weather exposure. Oil-based paints are not compatible with Timber Pro UV. Q. If I want my wood to remain very light and pale, why can’t I just use your Clear UV formula on my exterior wood? A. We think that our transparent series stains such as, Honey, Natural Gold, Woodlands, and Redwood are very light and transparent. However, they do darken the wood slightly, about as much as plain water or oil will darken wood. To this day, there is no clear or colorless UV inhibitor that prevents fading and graying for extended periods. It simply has not been invented yet! Our name, Timber Pro UV, indicates that we put in a lot more UV inhibitors than many companies do. Our UV inhibitors work best when used in conjunction with our tints. Therefore, we still do not recommend using our Clear UV alone on outdoor exposed wood unless you want your wood to eventually fade and gray out. We highly recommend that you use one of our transparent stain sealers rather than Clear UV by itself on wood that has is exposed to the sun. Q. What makes Timber Pro UV environmentally safe? A. Good question! Many coatings companies claim their products to be “environmentally safe” when they are not – it’s a marketing ploy. Get the facts by requesting a Material Safety Data Sheet on a product. This lists the hazardous ingredients and the percentage of each. Most wood stains average from 50-85% hazardous ingredients, especially the flammable or combustible ones. 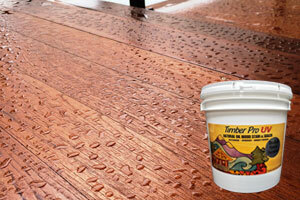 Timber Pro UV wood finishes are oil-based yet water-borne, and contain no flammable solvents. Hazardous materials make up less than 2% of our wood stains, an industry low. At 2%, even most chemically sensitive people have no problem using our product. Remember, it is more than just VOCs (odorous fumes) that contribute to the safety of a product: look at the percentage of hazardous ingredients as well. Some hazardous ingredients have little smell and don’t contribute to VOCs. If we could make a product with 0% hazardous ingredients we would do so, but the technology isn’t there yet. If a product contained nothing hazardous it most likely would never dry and cure and would be a food source for mold and mildew which it toxic in itself. Q. How can an oil based product be diluted with water, the two don’t mix! A. All of our Timber Pro UV products utilize the technology of water-borne oil resins with a touch of nano-particle acrylic resin, a true hybrid mix. These resins are environmentally safe and are more durable than solvent-borne soft oils. The oil resins in water-borne products are designed to mix with water, and the water completely backs out of the formula as it dries and cures. Most coating companies are still using solvent-borne oils for their oil-based wood stains because they are much cheaper. They are waiting until the EPA forces them to switch to the water-borne oils. By that time, Timber Pro UV and our very progressive chemists will be 15 years ahead of the pack! Q. How do I know when it is time to apply a maintenance coat? A. We are often asked “How long does your product last?” This is difficult to answer precisely because so many factors weigh into the answer. A home on the side of a snow-covered mountain or one in the middle of a blazing desert are obviously going to need more consistent care than a house on a tree-shaded lot in a temperate climate. Rule of thumb: clean yearly with Clean & Brite and re-apply Timber Pro UV before the color starts to noticeably change. On siding, if you applied a final Clear UV topcoat, you will notice that the slight sheen dulls over time. The wood will start to lighten a bit and look dry. Apply the maintenance coat of Clear UV at this time to refresh and maintain the wood surface. The two coats that have penetrated into the wood are still there, and will remain as long as you maintain the topcoat. Decks, especially new decks, need to be maintained on a yearly basis if your intent is to keep them looking great year round. Horizontal surfaces take a beating because water and dirt land on them. With older decks, some people wait until every other year, with a good cleaning in between. An older deck will absorb much more Timber Pro UV initially and will last longer between coats. Q. What is the shelf life on Timber Pro UV? A. Timber Pro UV will last at least one and a half years, which is beyond industry standard. Timber Pro UV should be stored in a sealed bucket and should not be frozen or exposed to extreme temperatures. Q. Can I mix another product with Timber Pro UV to stretch it or dilute it? A. Our formula is quite unique and other coatings may not mix with it. Some have added a little exterior latex paint to adjust color with good results but you do so at your own risk. You can thin the product with some water if you feel that it has thickened due to evaporation or exposure to heat. NEVER mix another stain product or chemical additives of any type with Timber Pro UV. Q. Can I spot treat with Timber Pro stain? A. Yes, but you need to be careful. You may notice that the lower part of a wall fades more than the upper part which is more protected, especially if you have large overhangs. You may need to re-apply a clear coat on the bottom part of the wall or even add a little of your original color to the Clear UV on the lower part of the wall to bring the color up to match the upper wall that hasn’t faded. You must feather in to the area however that doesn’t need to be retreated yet, rather than just apply an entire coat to the whole wall. Your goal is to keep the color uniform by adjusting the amount of color that you re-apply.